Why is coconut only a spring food? I eat it all year long but I only see it floating around the internet in force in spring (and then, as a cursory ingredient in tropical cocktails in summer). Coconut is treated like a spring sport: here in a flash, gone in an instant. It doesn’t even get Fall Ball or whatever baseball has in the autumn. I love coconut all year – it’s actually one of my favorite flavors. In fact: I’ll often choose coconut over chocolate. I KNOW, RIGHT? I’ve made this Coconut Chess Pie a few times now and, guys, it’s the best thing ever: it’s like a macaroon on crack, seriously. It’s got a smooth pudding like custard layer, made with eggs and buttermilk and coconut flavor and tons of sweetened coconut. If you love coconut like I do this is going to be the pie that knocks your socks off! 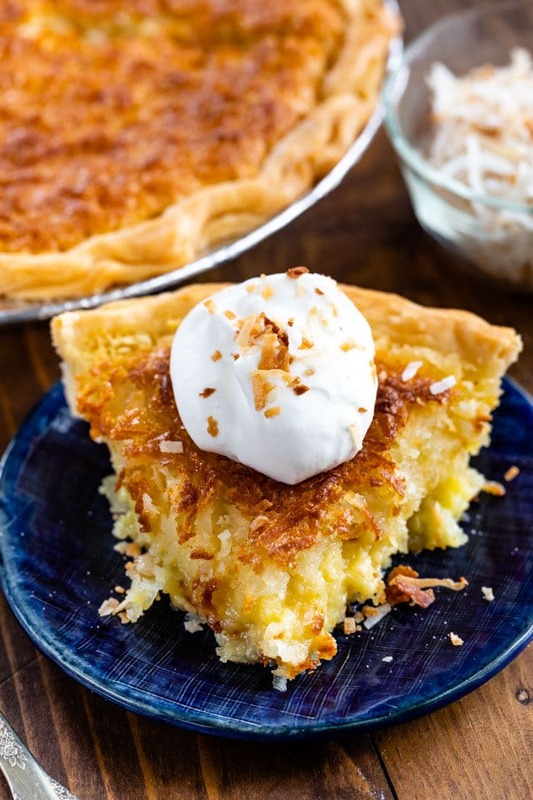 Coconut Chess Pie is like a creamy custard chess pie but with added coconut. It’s perfect served warm! I’m glad you asked! I never knew about chess pies until I was a blogger. I think they’re more of a midwest or southern dessert because, as a Californian, I’d never seen one until a few years ago. A chess pie is SO EASY because it has just a few ingredients. It’s egg based, with sugar and butter and flavorings. Some chess pies (like my Chocolate Chip Chess Pie) use cornmeal for binding, but this coconut version uses flour. 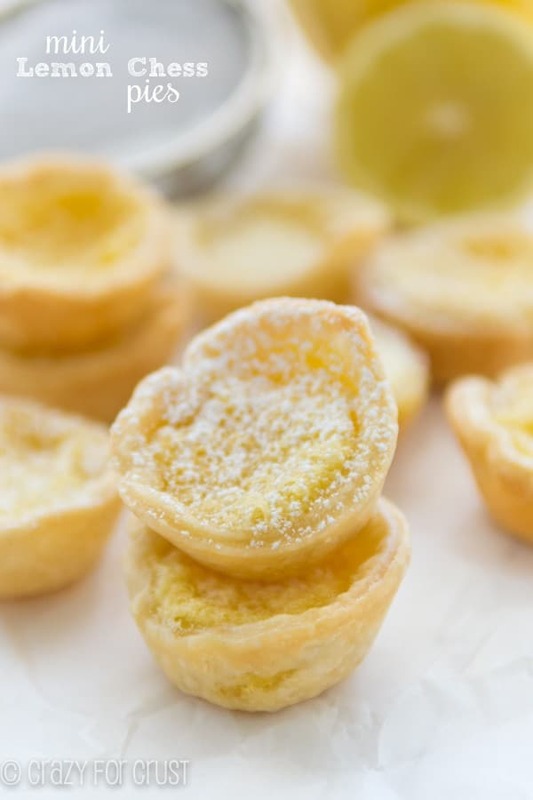 You can easily add flavorings to change up a chess pie to make lemon or chocolate or, now, coconut! Another ingredient most chess pies have is buttermilk. Have you ever heard of a buttermilk pie? That’s basically a chess pie too! What do you do if you don’t have buttermilk? Believe me, if there is one ingredient that I always forget to buy, it’s buttermilk. But you can easily make your own! To make your own buttermilk you can add vinegar to milk and let it sour up, that’s it! The rule of thumb is about 1 teaspoon of vinegar plus enough milk to make 1 cup equals one cup of buttermilk. For all of my substitutions, be sure to check out my guide to baking substitutions here! 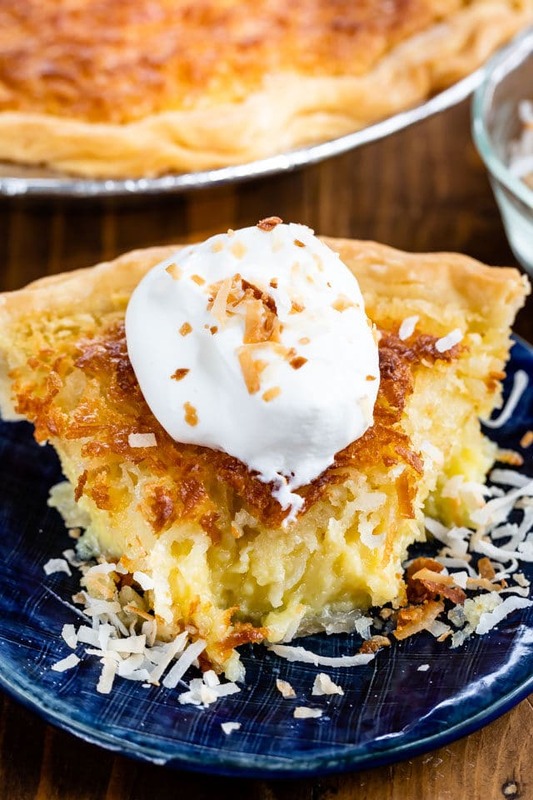 This Coconut Chess Pie comes together super easy. You can use a store-bought crust (I love Pillsbury) or make one from scratch. The rest of the ingredients come together with a whisk in one bowl. Simply stir and pour, then bake. 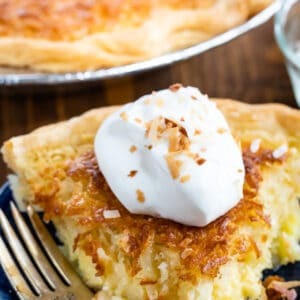 Top your Coconut Chess Pie with whipped cream or ice cream and then attack it with a fork. I won’t tell if you don’t even get a plate. How do you tell when a chess pie is done? You can use a knife to do the “toothpick test” around the edge of the pie, but I always do the jiggle test: simply jiggle the pie. If the center is only slightly jiggly, it’s done and will finish setting as it cools. It it seems really wet when you jiggle it, it’s not done. How do you store a chess pie? One thing I love about chess pies is that you can freeze them! If you happen to have any slices left over (or if you’re making your pie ahead and want to freeze it) you can. Just wrap it well in plastic wrap, or wrap each slice in a sealable sandwich bag. Let it defrost on the counter. Store leftovers in the refrigerator if you’re not freezing them. Be sure to check out my post on how I freeze almost all my desserts! Be sure your pie crust is cold when you bake the pie. Use a pie shield for best results. 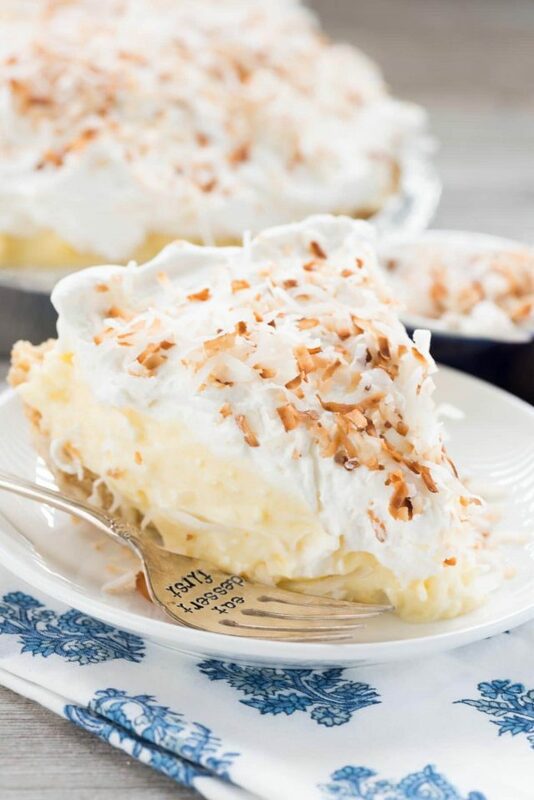 Use coconut extract to amp up the coconut flavor of the pie. You don’t have to, but then it’ll taste like buttermilk pie with coconut in it instead of a coconut pie. Remove from the oven when the center is just a bit jiggly and it’ll set as it cools. Don’t slice it too soon or it’ll ooze and fall apart. It’s best if it’s completely cool before slicing. Make homemade whipped cream using some coconut extract! Be sure to see how to toast coconut for some garnish. 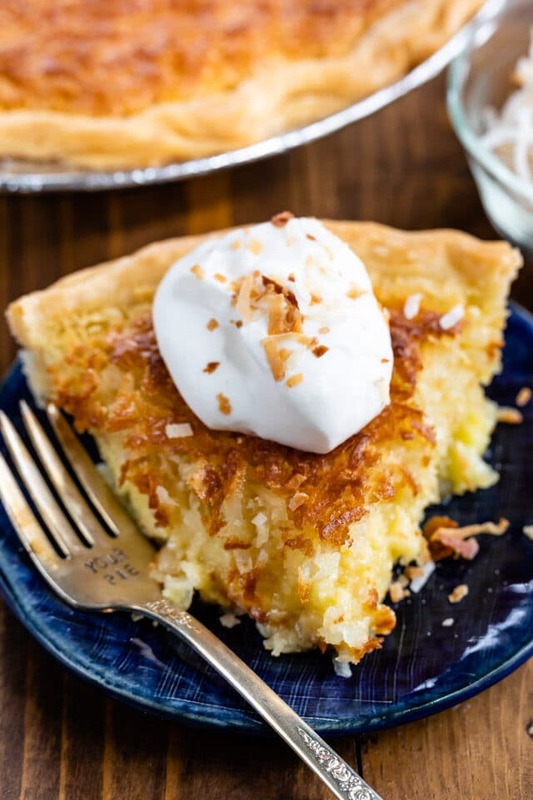 This easy Coconut Chess Pie is a baked custard buttermilk pie full of coconut! It tastes like a creamy macaroon pie! Preheat the oven to 350°F. Place pie crust in a 9” pie plate and crimp edges as desired. Chill until ready to fill. Whisk the eggs, then whisk in the flour and sugar until smooth. Whisk in the melted butter, both extracts, salt and the buttermilk. Stir in 2 cups of the coconut. Bake pie for 40-45 minutes. After 25 minutes, remove the shield from the outside of the crust so the edges will brown. Cool completely before serving. Optional for serving: place remaining 1/2 cup of coconut on a baking sheet at bake at 350°F for just a few minutes, stirring often, until it starts to turn brown. This can also be done in a skillet over medium-low heat. Let cool. Serve pie with whipped cream or Cool Whip and toasted coconut. To make your own buttermilk for this recipe, add 1/2 teaspoon vinegar to a measuring cup and fill it to 3/4 cup full of milk. Let sit for 5 minutes. This post was originally posted in 2014. Photos and recipe updated 2019. Can this Chess Pie be made leaving the coconut out ? 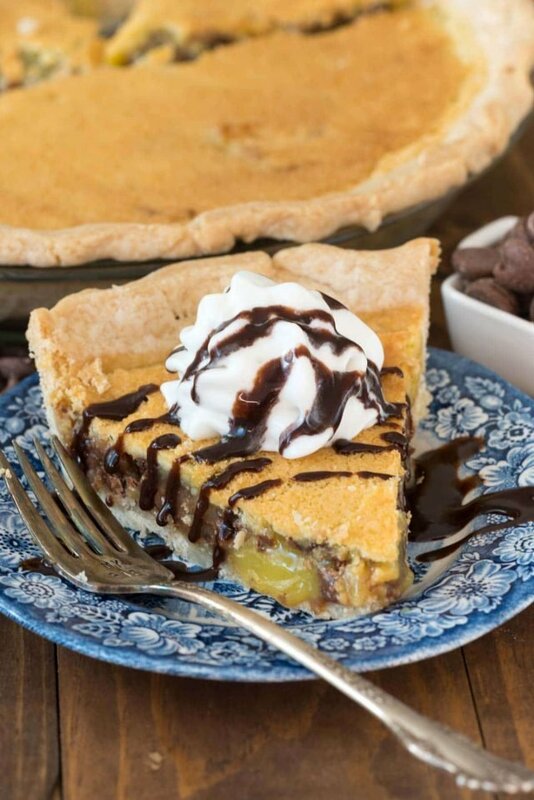 Love this version of a chess pie! Can’t wait to try, pinned! I was looking for a pie recipe for my husband and I stumbled on this article. I read and followed the instructions carefully and I made it deliciously! He is so happy! Thanks for this!